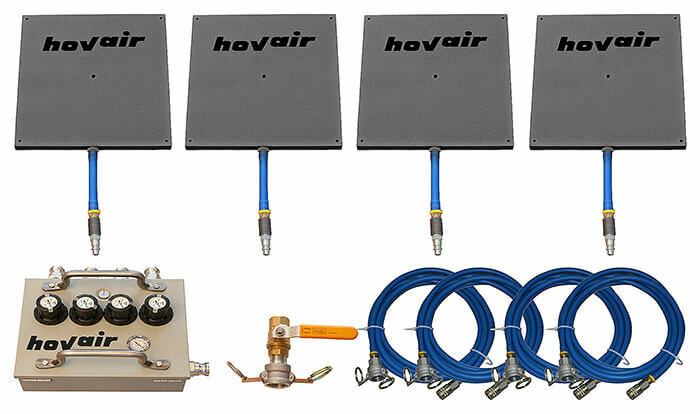 Hovair Systems air powered load moving products make the perfect rigging equipment when the going gets tough. Whether you are moving heavy machinery or awkward size and shape loads or even theater equipment, these air powered tools provide the ideal rigging equipment for the job in hand. Here are some typical load moving products being used as rigging equipment. Round steel air bearing kit complete with everything necessary to snap together, plug in your air, and go! Often used for permanent attachment to heavy machinery when repetitive movements are required. Each caster can be individually adjusted for air flow. Lightweight, aluminum air bearing kit complete with high lift air bearings and remote control as standard. Very low profile of around 1½” and can slide under suitable machinery and loads. What better lightweight rigging equipment? Tremendous lifting power. Lightweight, aluminum, platform transporters are a fine alternative to the air bearing kits. Sizes start at 4 ft x 3 ft and each transporter has 4 air bearings on board. Controls are via a side-facing manifold which offers easy adjustment and air flow control. Or how about turning your overhead gantry crane into a mobile lifting unit? No longer would the gantry be stuck in the loading dock. Connect your air line and take it to any location in your facility that needs a load lifting. Subject to local safety regulations, you could move the gantry from dock to dock, or use it to lift heavy machinery onto air bearing load moving systems, and lots more. Thanks to the omni-directional features of these amazing air bearings, your gantry crane can now move to places that it couldn’t reach before. The only restrictions being the height and narrowest part of the gantry. Rigging equipment that saves time and money! Please note: Regardless of the lifting capacity of air bearings fitted, the gantry crane will still only be able to safely lift the capacity it was designed for.